HÀ NỘI – The latest report by the Nhân Cơ aluminum manufacturer’s investor on an alkali leakage incident late last month said that it had not affected human health or the environment. The state-owned Vietnam National Coal – Mineral Industries Corporation (Vinacomin) also said in its report, submitted yesterday to the Industry and Trade Ministry, that it would ask its subsidiary Đắk Nông Aluminum Company (DAC) to install CCTV and monitor 24/7 the area where liquid alkali is stored. A line had broken in this area on July 23, letting concentrated alkaline fluid flow out into the environment. A worker turned off the line’s valve and managed to stop the leakage in four minutes, according to the report. 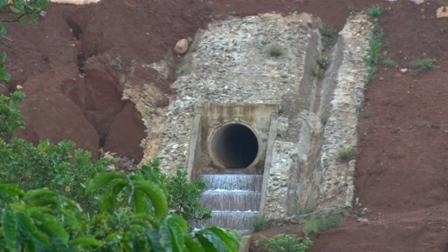 An inspection team led by the Environmental Impact Assessment and Appraisal Department of the Ministry of Natural Resources and Environment (MoNRE), along with the local department of the MoNRE, arrived at the scene the following day to determine the preliminary impact of the incident. The team said 9.53cu.m of alkali had leaked, of which some amount was absorbed by 600sq.m of earth outside the manufacturer’s premises. Some of the alkaline fluid flowed into the neighbouring Đắk Yao stream via sluice gate number three. After implementing a number of chemical measures for alkali neutralisation, the pH scale of the affected soil and water returned to levels permitted by Việt Nam’s standards. The DAC, which is in charge of running the Nhân Cơ aluminum manufacturing firm, is working with Chinese contractor China Aluminum International Engineering Corporation (CHALIECO) to inspect all stages from design to operations to discover the cause of the broken line. CHALIECO is the only contractor of the Nhân Cơ aluminum project.